Biological effects induced by radiation can be ultimately traced back to energy depositions at the cellular and sub-cellular scale. Radiation track structure modeling aims at the reconstruction of the spatial distribution of individual physical energy depositions of the primary particles and all its secondaries in the exposed biological target, and of what follows in terms e.g. of formation of chemical species and damage to relevant biological structure. Track structure modeling approaches have been widely adopted in the radiation research community, and have the potential of delivering a fundamental insight into mechanisms of cellular radiation response and allow for a correct interpretation of the results of radiobiological measurements and for their applications in radiation protection and radiation therapy. Albeit not exhaustive of cellular endpoints, DNA damage induced by radiation tracks is often chosen as a significative modeling endpoint. The complexity of such damage is indeed a good indicator of radiation “clustering properties”, i.e. how dense energy deposition events are. Obtaining information on damage at the DNA level therefore allows to compare the effectiveness of different “radiation qualities”, meaning not only particle types but also their energies. The increased biological effectiveness of densely ionizing radiation, which, in addition to the dosimetric advantage, is at the basis of the choice of particle vs. photon therapy, can e.g. be fully traced back to first principles with a track structure modeling approach. In our group we perform simulations of radiation track structures for a wide range of particle types and energies and for a variety of applications: these go from medical exposure scenarios (radiation therapy, radionuclide therapy), radiation protection for workers (radionuclide contamination) or in space. Simulation results are benchmarked with experimental data obtained within project collaborations or with ad-hoc measurements performed in our Radiobiology lab. Radiation transport calculations are also a necessary activity, to couple the results for very different spatial scale, going e.g. from the radiation environment in a manned space habitat or from the particle field on a tumor target volume in therapy to damages at the cellular/subcellualr level to the individuals. Research activities on track structure modeling are carried on in close collaboration with Werner Friedland’s group at the Institute of Radiation Protection, Department of Radiation Sciences, Helmholtz Zentrum München. 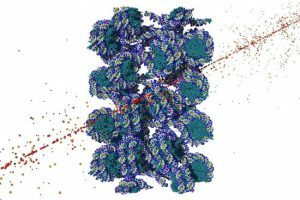 W. Friedland is the main developer of the biophysical code PARTRAC for track structure modeling up to DNA damage evaluation. Our activities on these topics have recently been funded by e.g. the European projects DoReMi and ANDANTE, and by the national INFN project RADIOSTEM. Alloni, D., Campa, A., Friedland, W., Mariotti, L. & Ottolenghi A. Track structure, radiation quality and initial radiobiological events: considerations based on the PARTRAC code experience. Int. J. Radiat. Biol. 88(1–2), 77–86 (2012). D. Alloni, L. Mariotti and A. Ottolenghi. Early Events Leading to Radiation-Induced Biological Effects. In: Brahme A. (Editor in Chief.) Comprehensive Biomedical Physics, vol. 7, pp. 1-22. Amsterdam: Elsevier(2014). G. Baiocco, S. Barbieri, G. Babini, J. Morini, D. Alloni, W. Friedland, P. Kundrát, E. Schmitt, M. Puchalska, L. Sihver, A. Ottolenghi. The origin of neutron biological effectiveness as a function of energy. Scientific Reports.